Mackenzie, Alexander Campbell, 1847-1935. Rose of Sharon (Album leaf). 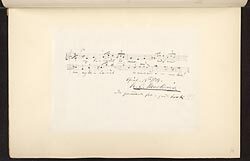 The Rose of Sharon (album leaf): autograph manuscript, 1884 Apr. 19.